LAWRENCE – In commemoration of the 50th anniversary of the Criminal Justice Act, a federal judge and scholars from across the country will explore issues surrounding access to the nation’s courts during a University of Kansas School of Law symposium this week. 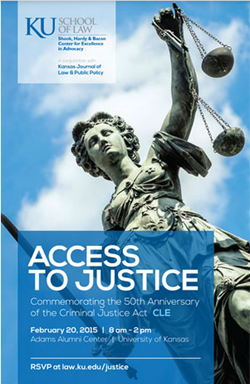 “Access to Justice” will run from 8 a.m. to 2 p.m. Friday, Feb. 20, at the Adams Alumni Center, 1266 Oread Ave. Co-sponsored by the Shook, Hardy & Bacon Center for Excellence and Advocacy and the Kansas Journal of Law & Public Policy, the program is free and open to the public, but registration is required. Scholarship from the symposium will be published in a 2015 issue of the Kansas Journal of Law & Public Policy. Three hours of continuing legal education credit, including one hour of ethics, will be offered for Kansas and Missouri. For more information and a complete agenda, visit the symposium website. Questions? Contact Paige Blevins at kjlppsymposium@gmail.com.